Tribune, Tronc And Beyond: A Slur, A Secret Payout, And A Looming Sale Tribune Publishing secretly started to pay more than $2.5 million to a fired news executive to settle a lawsuit. It sought to keep a slur by controlling owner Michael Ferro from becoming public. Michael Ferro's actions contributed to a series of crises at Tribune Publishing, where he was its chairman and largest investor. The group of about 20 people trooped from Chicago's iconic Tribune Tower on Michigan Avenue to an upscale restaurant nearby. In a private room, participants dined on seafood and steak while Ferro, then the company's chairman, held forth on his plans. His own net worth was newly in the nine figures. Associates and peers say Ferro held ambitions that were wide-ranging, even audacious, given the newspaper industry's stiff headwinds. At the dinner, as at other moments, Ferro railed against those who he felt were impeding him — including perceived rivals and competitors. Among them: the Southern California billionaire and civic leader Eli Broad, whom Ferro called part of a "Jewish cabal" that ran Los Angeles. This account of the evening is based on interviews with two attendees who separately say they heard Ferro make those remarks. A spokesman for Ferro denied the incident occurred and called the claim "reckless allegations." Early this year, however, Tribune Publishing made the first in a series of secret payments to total more than $2.5 million to avert a threatened lawsuit filed by a fired newspaper executive, according to three people with knowledge of the deal. That had the effect of keeping Ferro's anti-Semitic slur out of the public spotlight. The Chicago Tribune and Tribune Publishing moved out of the iconic Tribune Tower earlier this year. The payments, reported here for the first time, are stark embodiments of the consequences of Ferro's actions that contributed to a series of crises at Tribune Publishing. The LA Times has been sold. Tribune Publishing has put itself on the auction block and is reviewing three bids from potential buyers. Ferro no longer controls day-to-day operations; he stepped down as chairman after sexual harassment accusations arose involving his conduct outside Tribune Publishing. But the repercussions of Ferro's decisions continue to reverberate throughout the company. The most public insult was the company's mangled rebranding: The new futuristic name Tronc was instantly derided, halfheartedly defended and, in October, unceremoniously dumped. Ferro's ill-fated impulse to rebrand the newspaper company with tech glamour was accompanied by other incidents: waves of layoffs and buyouts for staffers at the same time executive compensation shot upward; a failed effort to hold off union organizing drives at its newsrooms across the country; a perplexing digital strategy called "gravitas with scale" to draw upon an army of writers outside the company; scandals that sidelined several top leaders; and the sale of the LA Times, at the time the company's most important property — and the one in which Ferro had taken the strongest interest. 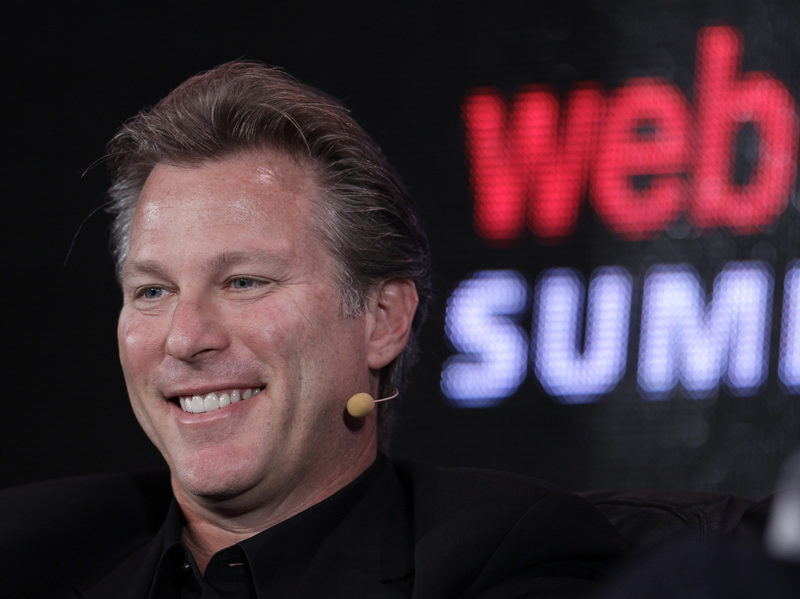 In several instances, controversies were further fueled by digital media executive Ross Levinsohn, Ferro's choice for publisher and CEO of the LA Times. This article is based on 12 fresh interviews, corporate documents and dozens of past interviews. Tribune Publishing spokeswoman Marisa Kollias cited policy not to comment on personnel matters. In a statement, Tribune Publishing never referred to Ferro by name but said: "Tribune Publishing values diversity, in its many forms, and expects the highest level of professionalism from each of our employees." It noted that two officials about whom NPR posed questions "no longer work for our company" — referring to Ferro and the former newspaper executive to whom the company made the confidential payments. 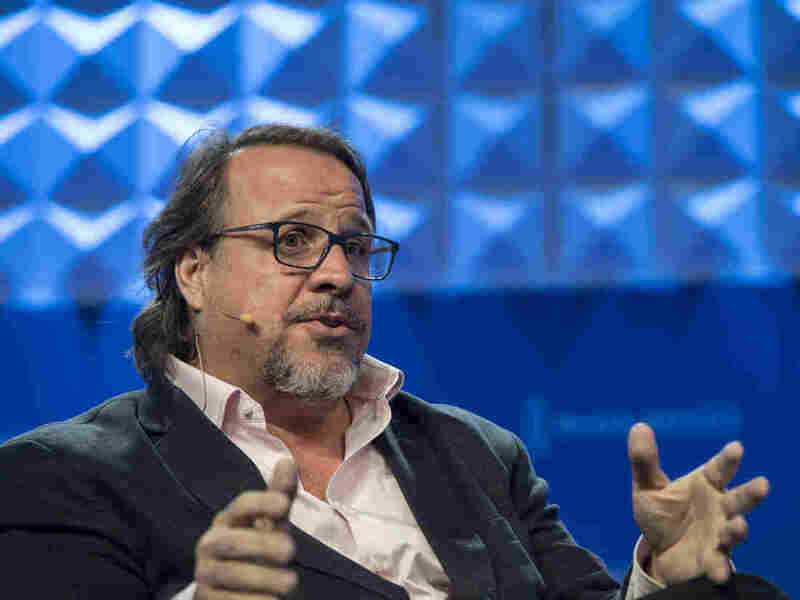 That said, Ferro still owned 25.6 percent of Tribune Publishing as of Sept. 30, meaning he continues to hold the largest stake in the publicly traded company. Justin Dearborn, a longtime business associate of Ferro, now leads the company as chairman and CEO. The financial prospects for Tribune Publishing were tough well before Ferro came on the scene. Earlier owners of the predecessor Tribune Co. sought to sustain profits through a series of cuts. Tribune entered bankruptcy after being loaded up with billions in debt by real estate magnate Sam Zell. The newspaper and digital arm of the old Chicago-based Tribune Co. was spun off in August 2014 to become Tribune Publishing — with real estate assets stripped out. "Before I got to Tribune Co., there was a lot of things going wrong," Ferro told CNBC in a June 2016 interview. "This company was built to fail." Ferro had roots in Chicago, control of the tabloid Chicago Sun-Times, and money to spend. In 2008, he had invested $20 million for a controlling stake in the failing health technology company Merge Healthcare and revived its fortunes. IBM bought the company in 2015 for $1 billion in equity and debt assumption, and Ferro personally made a nearly tenfold return on his investment. In early 2016, Ferro paid $44 million to acquire the largest share of Tribune Publishing and sold his stake in the Sun-Times. Ferro's investment in Tribune Publishing rose to nearly $100 million. Ferro became chairman and named Dearborn as his CEO. Dearborn had been CEO of Merge Healthcare under Ferro. Colleagues describe Ferro as erratic, buoyant, smart, ambitious and easily distracted. He promised digital savvy — including artificial intelligence and the creation of 2,000 original videos by Tribune Publishing properties every day. That suggested roughly 700 videos daily from the LA Times alone — an incredibly high volume. "I have no salary," Ferro told CNBC. "I'm a shareholder who's just working seven days a week right now to do the best I can along with our team ... to benefit all our shareholders." 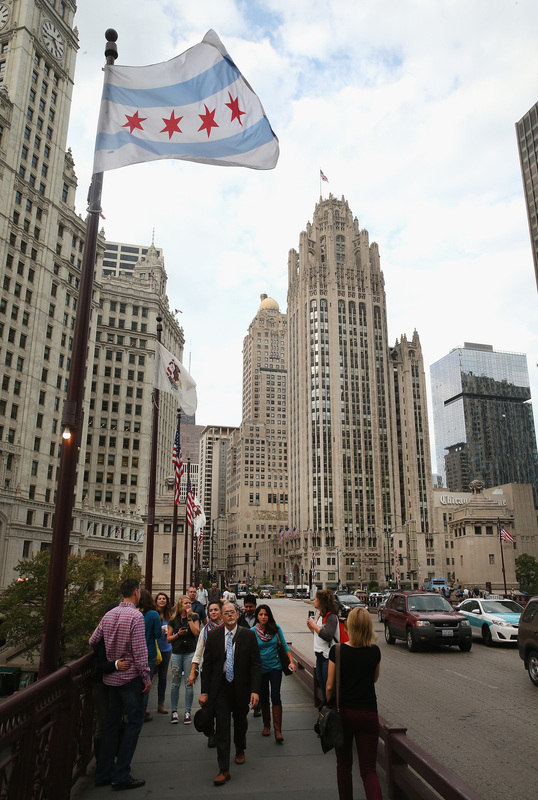 Ferro turned down an offer from the Gannett Co. to buy Tribune Publishing at a premium. At the time, NPR interviewed six senior media executives, and none voiced faith in Ferro's approach or credited him with a coherent strategy. One said he had an impossible job. Beyond the Chicago Tribune, the company owns The Baltimore Sun, the New York Daily News, the Hartford Courant, the Annapolis Capital Gazette, the Allentown, Pa., Morning Call, the Orlando Sentinel, the South Florida Sun-Sentinel and some recently acquired papers in Virginia. Its dominant paper was the LA Times. Along with The San Diego Union-Tribune to the south, the LA Times represented about half the company's revenues and audiences. Beyond its corporate importance, Southern California fascinated Ferro. Six former colleagues say he gravitated toward the wealth and celebrity Hollywood represented. 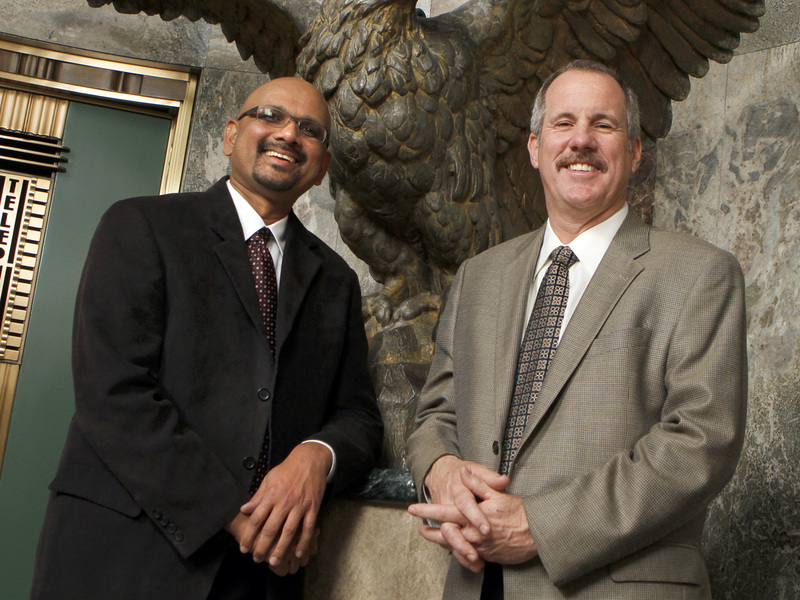 Michael Ferro named Davan Maharaj (left, seen here in 2011 with former Editor Russ Stanton) as editor-in-chief and publisher of the Los Angeles Times. Initially, Ferro turned to Davan Maharaj, a veteran of three decades at the LA Times who rose to be editor-in-chief. Ferro made Maharaj publisher, too, combining the chief news and business roles in a cost-saving move replicated around the newspaper chain. Maharaj introduced Ferro to powerful Los Angeles leaders. Yet Maharaj fought Ferro on proposals to cut the Times' Washington bureau, a historic strength, and to fold the Times' separate social media, design and other desks into one serving the entire chain from hubs in Los Angeles and Chicago, according to Times journalists. Maharaj also faced an increasingly restive newsroom. Among other things, several reporters complained that Maharaj put the brakes on an investigation of the recently retired medical dean of the regional powerhouse University of Southern California. The paper's ties with the campus included a partnership on a book fair. An internal review ensued. When it ultimately ran, the coverage had impact. The LA Times reporters' coverage, starting in the summer of 2017, prompted the state to strip the former dean of his medical license. It also led to the resignation of his successor, a broader scandal involving a campus doctor's abuse of female students, and the resignation of the president of the university. Yet the newsroom tensions handed Ferro an opportunity. The hiring of Ross Levinsohn as Los Angeles Times publisher and CEO set two damaging developments into motion. In August 2017, Tribune Publishing fired Maharaj and his top editors, naming Levinsohn as publisher and CEO. The decision set two damaging developments into motion. The first involved Maharaj's reaction. He hired a prominent Beverly Hills attorney to pursue a wrongful termination suit. Maharaj had ammunition, having recorded Ferro in unguarded conversation with associates. Tribune Publishing and Maharaj had agreed to mediation. According to people with knowledge of the process, a retired state judge acting as a mediator reviewed a sample of Ferro's remarks. That sample included the line from that fateful steakhouse dinner about Broad being part of a "Jewish cabal" running Los Angeles. The revelation could have proved explosive in Los Angeles. Broad and his wife, Edye, are active in California political circles. They have also given away more than $4 billion of their wealth, according to their foundation, including to such institutions as USC, UCLA, the Los Angeles County Museum and the newer Broad museum. Broad has also periodically mused about buying the LA Times. 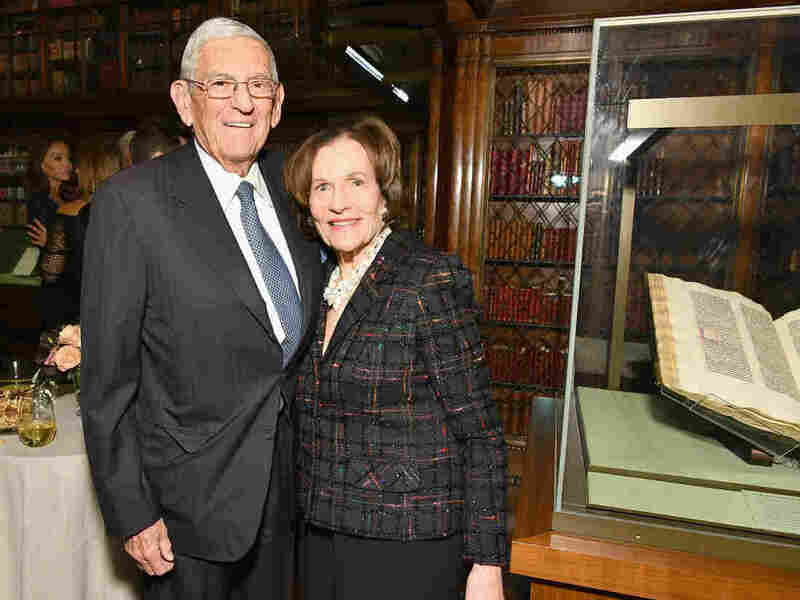 Eli Broad and his wife, Edye, are active in California political circles and have given away more than $4 billion of their wealth. The mediator encouraged Tribune Publishing executives to settle, saying they would not want those statements to be publicized, according to a person with knowledge of his advice. The company agreed to secretly pay Maharaj more than $2.5 million, in installments, according to three people with knowledge of the pact. That financial obligation was not disclosed in corporate filings to shareholders and analysts. The payments started in the first quarter of this year, for which Tribune Publishing reported a net loss of $14.8 million. The loss was attributed to the company's decision in December 2017 to pay Ferro $15 million in consulting fees even as he served as chairman and was the company's controlling owner. After this story was published, Maharaj's attorney, Eric George, told NPR: "We reject any assertion that Davan received any payments to keep information secret. Tronc and Maharaj agreed on a confidential settlement that reflected almost 30 years of exceptional service to the Los Angeles Times." A spokesman denied Ferro made the slur. "Regarding Mr. Broad, he and Mr. Ferro are friends and Mr. Ferro thinks the world of Mr. Broad," Ferro's spokesman, Dennis Culloton, said. Culloton said Ferro could not comment on personnel moves, including any severance agreement with Maharaj. The second damaging dynamic involved Maharaj's replacement. In summer 2016, Tribune Publishing had hired Ross Levinsohn to be its chief digital consultant and to guide the company on the future of the LA Times. He received $600,000. Levinsohn had been a top executive at Fox, Yahoo and the parent company of The Hollywood Reporter and Billboard publications. And Ferro saw Levinsohn as his way into proximity with entertainment, influence and fame, according to those who know Ferro. After sweeping away Maharaj and his lieutenants in August 2017, Ferro and Dearborn moved to install Levinsohn as CEO and publisher of the LA Times. Levinsohn would also oversee the parent company's digital portfolio and strategy. Even as the company cut back jobs in traditional newsrooms, Levinsohn and other executives acted to create a separate staff apart from the LA Times and its other newspaper properties. He planned to draw upon outside writers, some uncompensated or who would even pay for the privilege of being associated with the newspapers' brands. Plans included a consolidated entertainment website called LA.com and the outsourcing of Washington coverage to the digital news service Axios. Neither of those initiatives came to fruition. (LA.com still says "coming soon.") But the digital strategy, gravitas with scale, sparked distrust among journalists. Executives at Tribune Publishing and the LA Times intensified efforts to fend off the union. But their campaign was hobbled by disclosures about their compensation. Tribune Publishing had been paying for Ferro's private flights: $5.7 million for 2016 and 2017. The vast majority of that money involved corporate payments to Ferro's own holding company, Merrick Ventures, for use of its jet. Last December, Ferro relinquished the jet payments in favor of a $15 million consulting package: $5 million annually for three years. Even as chairman, Ferro would serve as a paid "consultant" to the company. CEO Dearborn made more than $8 million in 2016, according to the company's public filings. In 2017, Levinsohn made $6.9 million. Many journalists at the LA Times were growing wary of Levinsohn and the former business partner that he selected as editor-in-chief, Lewis D'Vorkin. They came under fire for failing to publicly defend the paper after the Walt Disney Co. condemned stories documenting financial windfalls it received from the city of Anaheim. D'Vorkin accused an unknown colleague of unethical behavior for leaking tapes of a staff meeting to The New York Times. Levinsohn moved to contain the public relations damage. He did so in ways that were unusual for an executive leading a major journalistic operation. When The New York Times sought to report on the backlash over Disney, Levinsohn called the paper's executive editor, Dean Baquet, to complain, according to three people with knowledge of the call. Baquet rebuffed the new publisher by saying "this is what reporters do," according to New York Times spokeswoman Danielle Rhoades Ha. In late October, Levinsohn's longtime business partner, James Heckman, sought to discourage The Wall Street Journal from writing about a bankrupt digital company they previously ran called Scout Media. Heckman and Levinsohn had also started up two digital outfits and worked together at Fox and Yahoo. Heckman dashed off a 4,100-word email to News Corp. CEO Robert Thomson, threatening a defamation suit on his and Levinsohn's behalf if the Journal went to print. "We wanted to provide you the opportunity to recover the truth, before we're both forced into a legal issue because of a young reporter's personal ambition," Heckman wrote to Thomson in the Oct. 27, 2017, email, obtained by NPR. "This needs to be fixed." Heckman invoked their common work for Rupert Murdoch — whose family controls News Corp. and Fox — and asked for a joint call with Levinsohn. He argued that the Journal's story would do "permanent, significant financial damage" to both men. "Your reporter is about to do damage to both of us," Heckman wrote, "to both of our reputations." The decision "was a fully independent judgment by Wall Street Journal editors based on perceived news value and related journalism issues," said Steve Severinghaus, a spokesman for the Journal's corporate parent. He said Thomson, the CEO, forwarded the email, largely unread, to lawyers and standards editors. The paper published a story narrowly focused on the bankruptcy. "Mr. Levinsohn did not prepare the referenced email, nor has he ever controlled what Mr. Heckman writes, says or does," Levinsohn's attorney, Charles Harder, wrote in an email to NPR. Heckman did not reply to a request for comment. Heckman and Levinsohn have a long professional history; Heckman copied Levinsohn on the email and included Levinsohn's mobile phone number for the News Corp. CEO to call. NPR has not seen any evidence that Levinsohn personally interceded with the Journal over the story. But it is consistent with how Levinsohn handled The New York Times — and NPR. In January, NPR was preparing reports about two past sexual harassment lawsuits in California naming Levinsohn as a defendant. Levinsohn was accused of fostering a "frat house" environment as an executive at the search engine company Alta Vista and conceded under oath he had assessed the "hotness" of female subordinates. The lawsuit against Levinsohn and others at Murdoch's Fox Interactive alleged that sexual harassment was rife in the workplace under Levinsohn, then a senior vice president. Alta Vista and Fox settled the lawsuits. In January 2018, Levinsohn called NPR's CEO, Jarl Mohn, to call the network's reporting "lies." Levinsohn threatened to retain legal counsel to sue if he felt disparaged, according to Mohn. Moments after NPR posted its story, Tribune Publishing said it had put Levinsohn on leave and announced an investigation. The next day, the LA Times newsroom's earlier union vote was tallied and shared publicly. It won overwhelming support at a paper that had prided itself for more than a century on keeping organized labor out of its newsroom. By this time, Ferro had had enough, former colleagues said. The labor unions would complicate the ability to cut costs. Levinsohn, Ferro's conduit to the fun side of the job, had been put on ice. Reporters from other outlets were looking into Ferro's own past behavior. On the same day the sale was announced, Tribune Publishing brought Levinsohn back as the company's chief digital officer. The company cited "a report to the board of directors finding no wrongdoing on the part of Mr. Levinsohn." In a more recent statement to NPR, Tribune Publishing said Levinsohn has proved to be "an inclusive and trusted leader." In March, Ferro announced he was retiring. Hours later, he was accused in Fortune magazine of inappropriate advances by two women seeking to do business. Ferro made a deal to sell his stake in the company, but it fell through. Tribune Publishing said it would pay Ferro the $15 million in fees at once. In subsequent months, unions won recognition at the Chicago Tribune, Tribune Publishing's newly purchased Virginia metro papers, and the company's suburban publications in Maryland, which include the Capital Gazette papers. A man wielding a shotgun stormed its Annapolis newsroom earlier this year and killed five staffers, including four journalists. Reporters from sister papers filled in at Capital Gazette. So did some journalists working elsewhere, some of whose pay was covered by their own employers. The foundation of Ferro and his family contributed $1 million toward a charitable fund set up to aid the families of the newspaper's employees. The company has also cited the crisis in Annapolis as an unexpected cost. Since then, Tribune Publishing executives have embarked on more buyouts and layoffs. Financial documents filed last month show Ferro's "consulting" payment was reduced by $2.5 million to $12.5 million in the second quarter this year. The company also agreed to pay an added $300,000 in legal fees directly to Ferro's lawyers. Ferro's spokesman said they were "incurred during potential transactions Mr. Ferro was negotiating on behalf of the company during his time as chairman." Tribune Publishing would not comment. In public filings, Tribune Publishing disclosed that a small group of remaining top executives would receive significant payouts if the company were sold, including $4.9 million for Dearborn and $10.5 million for Levinsohn. The company had no comment on when — or whether — it will accept any of the bids it has received. Note: The story has been updated to include a statement from Davan Maharaj's lawyer. This story was edited to clarify the terms under which people filled in at the Capital Gazette and related papers. Tribune Publishing and Baltimore Sun Media Group officials say they sought to ensure that all journalists who offered to fill in were compensated for their work, either by their own employers or by Tribune Publishing.